This week, news broke that Disney is in talks to purchase 21st Century Fox. Consolidation of the two entertainment megapowers comes at a strategic time for Disney, who announced back in August that they'll be ending their content partnership with Netflix in 2019. Both Disney and Fox have Q3 earnings calls this week. In the context of these moves, in this post we look at Disney's answer to the Netflix question. 1. More money, more [ characters / movies / creativity / reach ]. Monetization floats all boats for Disney, and enables the company to invest heavily in creative IP and afford a higher CAC. 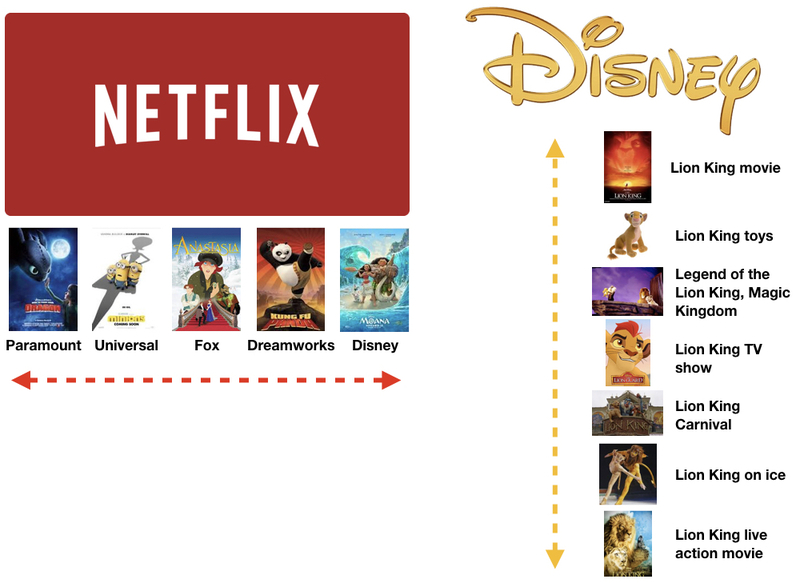 Whereas Netflix's horizontal model enables greater distribution, Disney is pursuing a vertical model in order to deepen monetization and unlock (expensive) proprietary creative processes and brand extension opportunities. 2. Owned platform > borrowed turf. Netflix has the distribution, but Disney has the content. Both are making moves into the other's territory. Distribution makes for a formidable foe, but Disney's merger with 21st Century Fox (if it goes through) will give the company access to existing streaming assets (Hulu) and further expand its content library and monetization opportunities. Do people come for the content, or do they come for the platform? It's likely a little of both, but we think content is king. In August, Disney announced that they would end their content partnership with Netflix in 2019 and roll out their own streaming service. In order to understand why CEO Bob Iger characterized such a move as “an extremely important, very, very significant strategic shift”, we'll dive into the history of Disney and examine the unique growth engine that has remained at the heart of Disney since the 1950s. 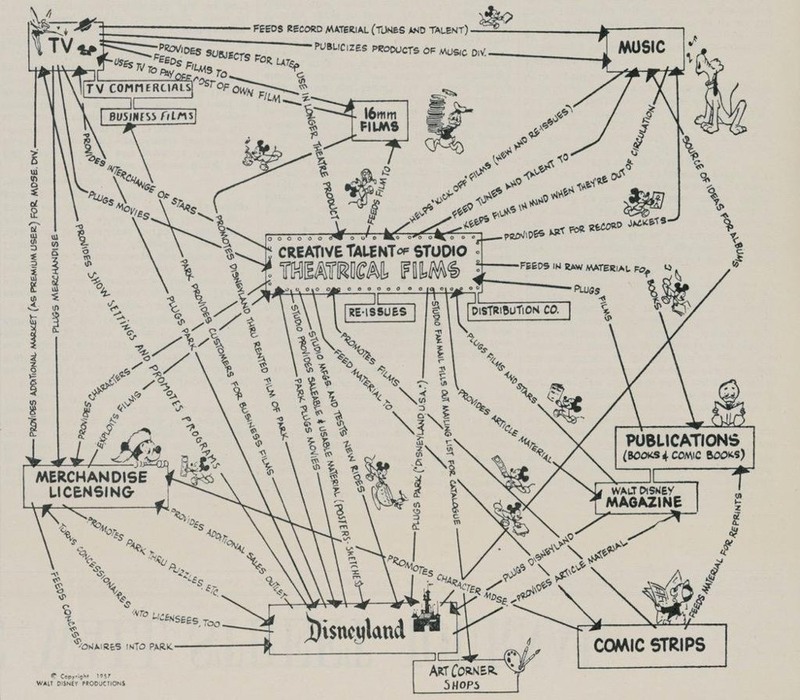 These maps demonstrate just how deeply Walt Disney was able to understand and build the growth engine that powered Disney’s growth for 60 more years and counting. Astonishingly, the maps still represent a fairly accurate picture of modern day Disney. Right at the center sat Walt Disney Studios, which was the creative heart of Disney and responsible for generating a continual stream of original characters and stories like Mickey Mouse or Scrooge McDuck that could be continually reinvented and reintroduced to each generation. 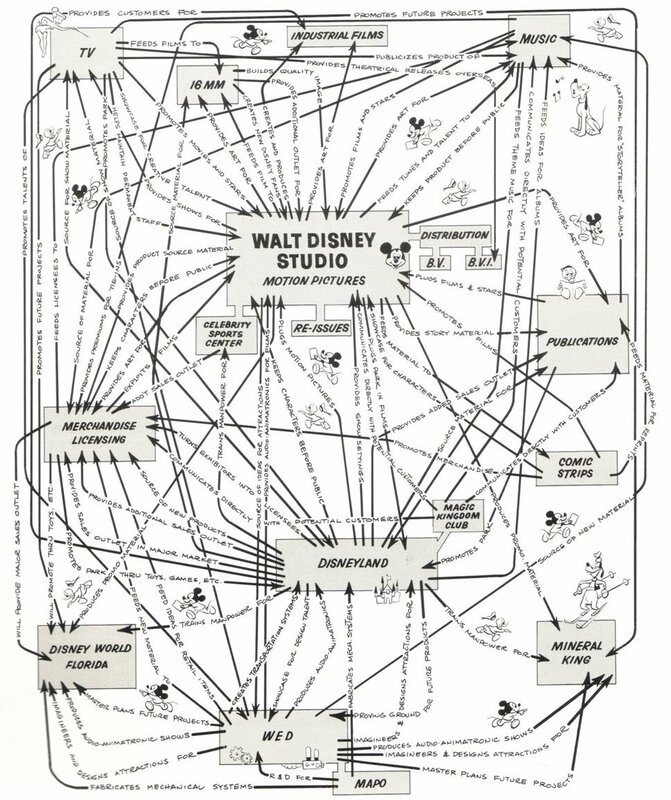 Surrounding it were the various channels that Disney could continue to get these characters out into the world, monetizing them in wider and deeper ways than any of its rival studios. 1. Movie studios tend to be “hits driven” with one off movies succeeding or failing on their own terms at the box office. By contrast, Disney movies focused on introducing timeless characters who could be continually refreshed over generations and continually monetized over a broad range of channels. 2. Movie studios tended to employ creatives only over the duration of a single project. Disney’s deeper -- and more consistent -- monetization allowed them to form “studios” of full time creatives solely responsible for generating new IP. For example, the Cars franchise has made $1.4B in global box office sales but over $10B in merchandising. This combination of deeper monetization coupled with a creative system continually spinning off new IP forms the growth engine that continues to power Disney’s dominance today. Over the course of Disney’s 94 year existence, it has only had 3 CEOs with multi-decade tenures: Roy Disney (1929 - 1971), Michael Eisner (1984 - 2005) and Bob Iger (2005 - Present). Eisner, formerly CEO of Paramount, failed to understand the creative core that differentiated Disney from other studios. While his first decade at Disney lead to a string of hits, culminating in The Lion King in 1994, the death of business partner Frank Wells and the departure of creative lead Jeffrey Katzenberg lead to Disney’s “lost decade” of creative disgruntlement and unmemorable movies. Driven more by stock performance and short term profits, Eisner drastically cut resources to creative departments, choking off the supply of fresh IP that also supplied original, monetizable material to other departments. Additionally, acquisitions like Miramax and ESPN, while financially successful, also failed to add synergy to Disney’s core growth engine. While such moves might have been applauded at during Eisner’s days at Paramount, this failure to understand how Disney’s growth engine worked almost fatally weakened the company and lead to his high profile ouster. Bob Iger’s tenure thus far reflects a return to fundamentals as demonstrated by 2 key acquisitions. 1. Disney’s $7.4B acquisition of Pixar in 2006 was vital in helping them revitalize their creative process. Similar to Apple’s “reverse takeover” of NeXT (where NeXT CEO Steve Jobs was put in charge of Apple), Disney’s Pixar acquisition put creative chief John Lasseter in charge of Disney Studios and restarted their ability to generate compelling stories that would lead to long term IP. 2. Disney’s $4B acquisition of Marvel in 2009 and $4.1B acquisition of LucasFilms (Star Wars) in 2012 showed how Disney understood the synergies that drive Disney’s growth. Both Marvel and LucasFilms brought along IP with multi-decade legacies while Disney brought along it’s unique ecosystem that allowed them to more deeply monetize that IP, resulting in a deal that added value to both sides. Bob Iger spent his first decade at Disney getting the creative engine spinning again so that it could generate fresh IP at a constant rate. But, this recently announced Netflix deal demonstrates that the company is paying just as much attention to enhancing the surrounding ecosystem in order to better monetize all that new content. Netflix, as the ultimate horizontal entertainment company (they sell a single product, at 3 different price points, to every country in the world except 4) was always an uncomfortable fit for Disney’s vertically integrated content. Since Netflix treated Disney’s content exactly the same as every other piece of content, there was no opportunity to leverage any synergies to connect that distribution to grow the rest of Disney -- whether that’s via cross-sells to toys and merchandise, or upsells to a physical experience or event (imagine the next Disney movie with an AR add-on!). By moving content onto a platform they control, Disney now has the ability to innovate on new ways of presenting their content that drive deeper integration with the rest of Disney. Product changes that would encourage viewers to buy more toys or visit the parks would allow for even deeper monetization, putting Disney in an even more superior position to acquire or develop new IP. We can't be sure yet if the value of these new opportunities make up for losing the distributional reach of Netflix, but Disney, of all entertainment companies, is uniquely suited to forging their own path in the streaming space. Most tech companies are so young that we have very few examples of transitioning from founder to non-founder leaders and the effect that shift has on growth. Disney’s 94 year history gives us a look at both the danger of optimizing for short term financial gain at the cost of choking off your growth engine, and how durable great growth engines can be.